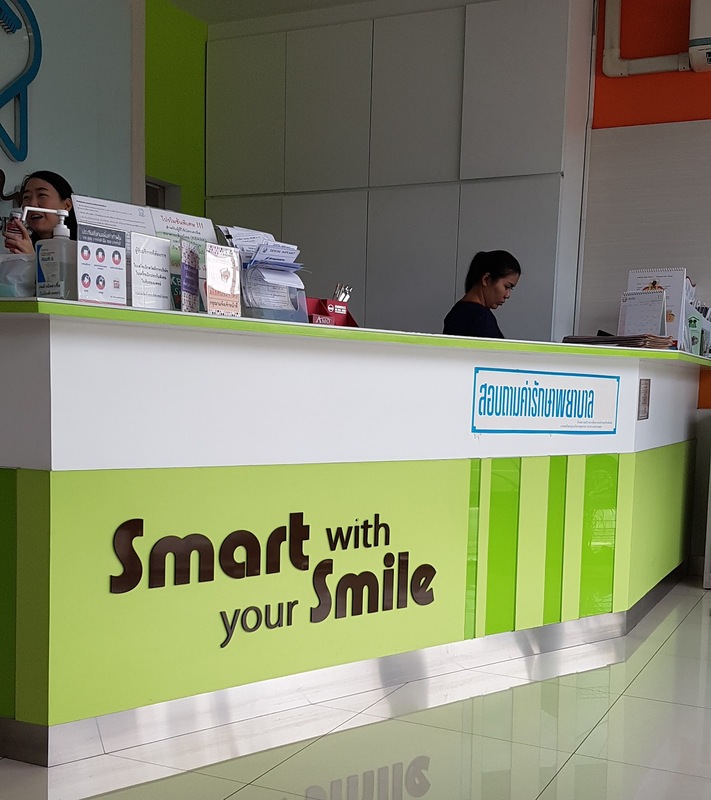 Late October, Heath and I travelled to Bangkok to see a dentist. This SOUNDS daft and 1st world rich people thing to do but bear with me. Australian dentistry is NOT covered by medicare. In the 1970s the government at the time declared that teeth were not essential and will not be covered by the health care. SO. People like me can't afford $554 for a filling and up for other services. (Not joking a filling is $554 and I shopped around. 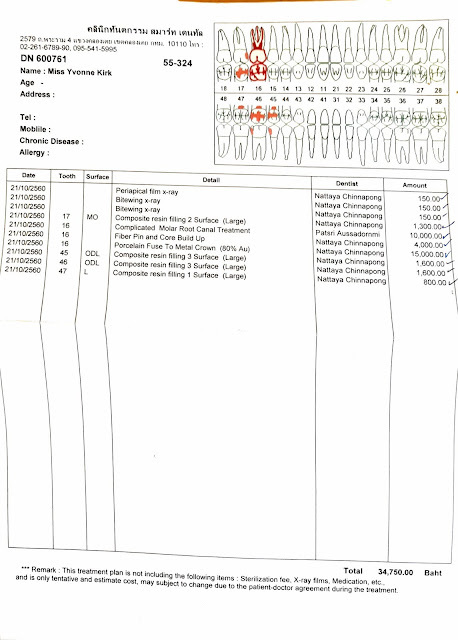 Xrays of your mouth, in which they give you no option, are $110 each and again there are fancier ones that cost more. By the time I found a dentist that only took what the private health insurance would pay and not claim the gap, I had constatnt pain in my head and jaw. OK I was given a referral to a lady in Strathfield (3 hours away from my house). No one local would take me as they were booked up and this endodontist could see me in december. Um.. my tooth is dying here. It even started to go a shade of black/grey. The cost would be $4500 for the root canalor more if it is complicated. PLUS the cost of the crown which would be extra. $3000 for ceramic and $5000-7500 for metal or gold. How do people afford this?? Debra reminded me that she had an excellent dentist in Bangkok. Couldn't recomment them highly enough. Heath went looking for tickets and I got a quote for my work. Heath also needed work, he was told by his dentist that he needed up to 3 crowns. With flight, hotels and the dentist in Bangkok, its was cheaper to get all my teeth done and we would have change. SO we committed to going. We booked in and waited for october 20 to come around. Skipping to the dentist. Cause Bangkok is a horrible, smelly, poor city that needs to concetrate on provided sanitation and infrastructure and stop building new skyscrapers for tourists. The dental clinic was nestled in an industrial, poor area and surrounded by bike parts places. I was initally nervous as to where I had been sent! I need not have worried as the clinic was an osasis of clean modern and 21st century dentistry. After my assessment on the Sat, I was booked in that arvo for a root canal. Bang. IN and done. The dentist was so gentle and I honestly felt calm enough to drift off to sleep. Not bad for a girl who is terrified of dentists. We had our work spred over the week we were there which was slightly annoying but you have to give your gums a rest. I had a dental appointment every second day. 5 fillings one root canal and a crown. Came to ฿35950 (Durin the crown posting, they found a hidden tiny cavity so I had to pay ฿1200 extra from the quote. I love that everything is itemised. YOu don't go in and surprise!! Have a huge bill as what happens in Australia. WOuld I go back? I would, not for one filling, but yes. For major dental, the trip was worth every cent. I had a PS. I also went to see a dermatologist in Yanghee Hospital. She fixed my year long spot on my face, SO simply! Really? ?So the horribly expensive dermatologist said used pawpaw cream. Nothing worked. It got worse and sore. I go to Thailand. Spend 30 mins in a hospital, get ฿500 of cream and cleaner and within 2 days its clearing up. WHY CAN'T WE HAVE GOOD DOCTORS IN AUSTRALIA? WHY?